Five years of nagging, and we finally do it! Yes, we've got a dog (the one on the right). The kids agreed to give up Christmas presents in exchange for having a dog. 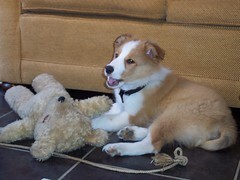 He's a Border Collie and is ten weeks old in this picture. Named Basil, after Basil the Brush (the one on the left). House training is going well so far! Congratulations... A Border Collie is quite a lot of work but very rewarding. I'm sure he'll be great fun for everybody!